In the spring of 2016 Tatiana Larina enjoyed a huge success as LUCIA DI LAMMERMOOR at the Cologne Opera House. Before, she already earned great acclaim for the portrayal of this very role at the International Music Festival Immling and was awarded here the 'TZ Rose of the Week', an award which is given for outstanding cultural achievements. In summer 2014 the artist was awarded the Austrian Music Theatre Prize “The Golden Schikaneder” for this interpretation. In 2011 the Georgian artist gained considerable attention for her VITELLIA in ‘La Clemeza di Tito’ and the SOPRANO PART in the ‘Verdi Requiem’ at the Opera House Cologne. Prior to these performances she was very successful as TATIANA in ‘Eugen Onegin’ at the Quebec Opera House and in Don ‘Giovanni’ at the Eutin Festival. 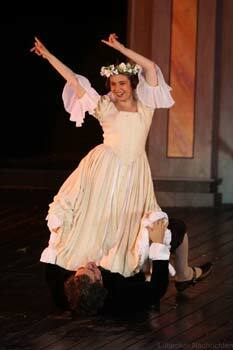 Until 2003 the young soprano Tatiana Larina studied singing and vocal pedagogy at the Stawropol University. Since 2008 she continues her studies with Kammersängerin Brigitte Eisenfeld in Berlin, where she also lives. The coloratura soprano absolved master classes with Margherita Rinaldi. Tatiana Larina made her first stage experiences at the Kutaisi Opera House (Georgian Republic), at the Opera House in Rostov at the Don (Russia) and at the Theatre of Musical Comedy in Pjatigorsk (Russia ). Here, the excellent actress, who shows great stage presence, successfully performed such roles as ADINA, MUSETTA, ADELE, OXANA in Tchaikovsky’s ‘ The Blacksmith Vakula’, MARFA in ‘The Tsar’s Bride’, NEDDA and VIOLETTA VALÉRY. Tatiana Larina also regularly performs as a concert singer with the Stawropol Philharmonic Orchestra. 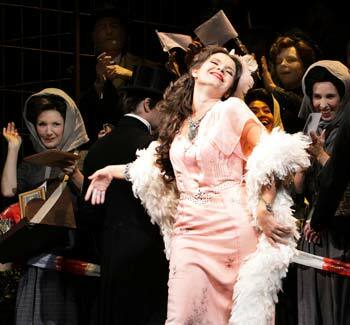 In the season 13/14 the artist returned to the Pforzheim Theatre in FIORDILIGI and the three female roles OLYMPIA/ANTONIA/GIULIETTA in ‘Les Contes d’Hoffmann’, which in summer 2015 she also portrayed at the Immling Music Festival. In the season 2014/15 she made her debut as DONNA ANNA at the Wuppertal Opera House and sang LIDA in ‘La Battaglia di Legnano’ under the musical direction of Michael Hofstetter . In the season 15/16 Tatiana Larina was very succesful in the title part in Bellini’s LA STRANIERA at the Passau/Landshut Theatre. Here, she also sang in opera concerts. In 2017 Tatiana Larina debutes as GILDA in ‘Rigoletto’ at teh Festival St. Margarethen (Vienna). 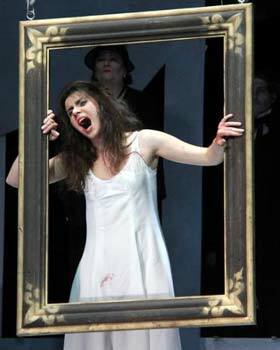 TATIANA LARINA depicted the ambivalent character of ALAIDE/AGNESE with gripping drama and sensitive cantilenas. Her soprano voice, which has the necessary reserves and a flexible technique, even in the high registers, brings out some remarkable points. Time and again she surprised with new facets of her artistic vocal abilities and she fully succeeded in fulfilling the title part. 'In the focus: Tatiana Larina. The Georgian singer has already enjoyed great successes at several medium-size stages. She has what it takes for the part of Alaide: a perfectly controlled soprano voice, melodiously reposing in the middle registers and never unsoundly erupting, efforless, perfectly controlled high notes and a considerable will to perform. It is the pure belcanto, which makes Bellini's operas so delightful. That's why they don't work without a top casted title role. Therefore, the young Georgian singer Tatiana Larina was engaged. Effortlessly, with an expressive stage presence she portrays the character of Adelaide, a woman in a red shining dress, who only follows her inner voice. She sings her coloraturas with the lightness of a butterfly, that simultaneously flaps its wings - estatically in the high registers, with abysmal shades in the low registers. Like a diamond her soprano voice shines above the waves of tutti's and in the sweetest pianissimo she touches right in the middle of the soul. 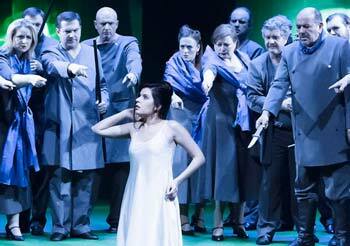 Especially the female voices are touching and enchanting: the Georgian Tatiana Larina in the title role, admirably gentle, then again dramatic and effortlessly switching from warm low-pitched to clear coloraturas. Merely by virtue of Tatiana Larina, who successfuly debuted here as Lucia two years ago, the scheduling of this opera was justified. The young Gregorian singer's performances was considerbely close to the vocal interpretation of the female roles, which many great singer before her failed. With a tenderly primed tone and not at all soubrette-like, she fulminantly mastered Olympia's coloraturas, sang AntoniaÄs part with the necessary richness and warmth. Also in the lower registers of Guiletta's part she rode flawlessly. Be it the soulless doll Olympia, the sensitive Antonia or the calculating courtisan Giulietta. 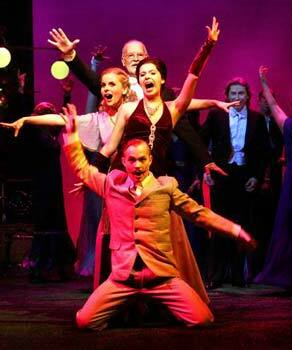 To find someone who can portrays all 3 roles on stage is not always that easy. Each one of these roles requires very particulay vocal skills. At the opera festival in Immling one succeeded in finding such a singer in the person of the young Russian Tatiana Larina. Daringly, she faces up the challenge and succeeds. How beautiful to hear for a change the masterly Olympia aria not sung by a twittering soubrette but by a velvetly soft lyrical soprano, with precisely polished coloraturas and perfectly secure high peaks , despite her dark foudation. As the doomed Antonia, Tatiana Larina can entirely develop her vocal potential, before slipping into the costume of the seductress Giulietta- finally sealing Hoffmann's fall. Tatiana Larina sings Donna Anna with a brilliant soprano. “...anyway the colorful mixture of outstandingly beautiful voices surely was impressive and reminds of former successes on Eutin's 'green hill'.